“Friend” was an important concept for Mr. Lincoln. 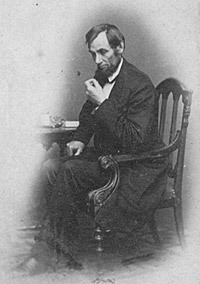 Writing his political autobiography in 1860, Lincoln recalled that after his business failed in New Salem, “He was now without means and out of business, but was anxious to remain with his friends who had treated him with so much generosity.”1 However, an 1854 editorial – which Mr. Lincoln probably wrote for the Illinois Journal but which referred to himself in the third person – suggests that Mr. Lincoln understood the limits of friendship. Abraham Lincoln has a fine meadow, containing beautiful springs of water, and well fenced, which John Calhoun had agreed with Abraham (originally owning the land in common) should be his, and the agreement had been consummated in the most solemn manner, regarded by both as sacred…. John Calhoun then looks with a longing eye on Lincoln’s meadow, and goes to it and throws down the fences, and exposes it to the ravages of his starving and famishing cattle. Biographer William E. Barton wrote: “Lincoln was self-assertive to the point of arrogance. He made demands upon his friends which had no meaning except as he and they understood his position of superiority. The patient, humble Lincoln is known, or supposed to be known, to the world; but the men who really knew Lincoln knew a man so confident of his own powers, and so sure of his right to demand the loyalty and obedience of other men, that they never quite understood him. But they did his bidding.”4 Contemporaries noted with chagrin the limits of their influence over Mr. Lincoln. Mr. Lincoln was the conductor and they were the orchestra. 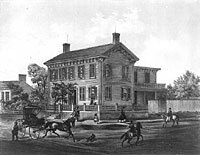 Herndon wrote: “He was the most secretive- reticent – shut-mouthed man that ever lived.” Mr. Lincoln did consult with his friends – but he didn’t necessarily take their advice, help their clients, or give them the jobs they wanted. And the nature of his job as President required him to manipulate people whether they were Cabinet members, members of Congress, journalists or generals. For example, he manipulated Tribune editor Horace Greeley into taking a major role in the aborted peace negotiations in Niagara Falls in July 1864 – but still protected Greeley from the full impact of revelations of his naiveté. Roy P. Basler, editor, The Collected Works of Abraham Lincoln, Volume IV, p. 64 (ca June 1860). Albert J. Beveridge, Abraham Lincoln, 1809-1858, Volume II, p. 238-239 (Illinois Journal, September 11, 1854). Shelby M. Cullom, Fifty Years of Public Service, p. 97-98. William E. Barton, The Life of Abraham Lincoln, Volume I, p. xxxx. Douglas L. Wilson and Rodney O. Davis, editor, Herndon’s Informants, p. 153 (Letter from Richard J. Oglesby to William H. Herndon, January 5, 1866). Douglas L. Wilson and Rodney O. Davis, editor, Herndon’s Informants, p. 63 (William H. Herndon interview with John Todd Stuart, ca. late June 1865). Emanuel Hertz, The Hidden Lincoln, p. 134 (Letter from William H. Herndon to Jesse W. Weik, January 15, 1886). Emanuel Hertz, The Hidden Lincoln, p. 134-135 (Letter from William H. Herndon to Jesse W. Weik, January 15, 1886). Rufus Rockwell Wilson, editor, Lincoln Among His Friends: A Sheaf of Intimate Memories, p. 179 (George P. Floyd, McClure’s Magazine, January 1908). Douglas L. Wilson and Rodney O. Davis, editor, Herndon’s Informants, p. 168 (Letter from Leonard Swett to William H. Herndon, January 17, 1866). Douglas L. Wilson and Rodney O. Davis, editor, Herndon’s Informants, p. 348, 350 (Interview with David Davis, September 20, 1866). Douglas L. Wilson and Rodney O. Davis, editor, Herndon’s Informants, p. 529 (Interview with David Davis, ca. 1866). Douglas L. Wilson and Rodney O. Davis, editor, Herndon’s Informants, p. 167 (Leonard Swett’s letter to William H. Herndon, January 17, 1866). Theodore Calvin Pease and James G. Randall, editor, The Diary of Orville Hickman Browning, Volume II, p. 23-24. Douglas L. Wilson and Rodney O. Davis, editor, Herndon’s Informants, p. 345. Douglas L. Wilson and Rodney O. Davis, editor, Herndon’s Informants, p. 348. David M. Silver, Lincoln’s Supreme Court, p. 82 (Letter from David Davis to William W. Orme, March 30, 1864). Willard L. King, Lincoln’s Manager, David Davis, p. 85 (Letter from David Davis to Sarah Davis, November 3, 1851). Willard L. King, Lincoln’s Manager, David Davis, p. 90. Douglas L. Wilson and Rodney O. Davis, editor, Herndon’s Informants, p. 587. Michael Burlingame, editor, “Lincoln’s Humor” and Other Essays of Benjamin Thomas, p. 144. Douglas L. Wilson and Rodney O. Davis, editor, Herndon’s Informants, p. 166. Henry Rankin, Abraham Lincoln: The First American, p. 56. Mark E. Neely, Jr., The Abraham Lincoln Encyclopedia, p. 176. William H. Herndon and Jesse W. Weik, Herndon’s Life of Abraham Lincoln, p. 348. Josiah Holland, Life of Abraham Lincoln, p. 241. William H. Herndon and Jesse W. Weik, Herndon’s Life of Abraham Lincoln, p. 471. Brian R. Dirck, Lincoln & Davis: Imagining America, 1809-1865, p. 54. William H. Herndon and Jesse W. Weik, Herndon’s Life of Abraham Lincoln, p. 483. Howard K. Beale, editor, The Diary of Edward Bates, p. 333.